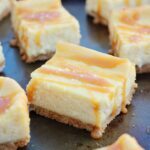 Salted Caramel Cheesecake Bars – Creamy cheesecake bars with a buttery graham cracker crust and topped with salted caramel sauce … This is the perfect Cheesecake Bars Recipe! 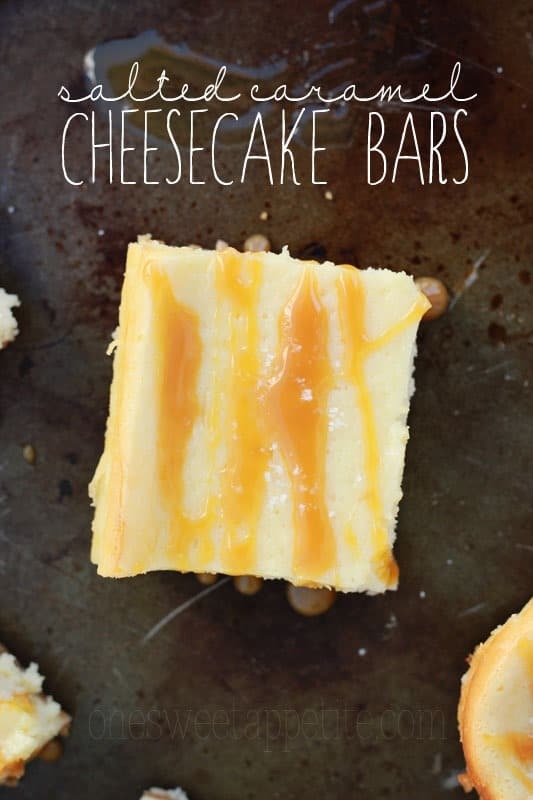 These cheesecake bars are the reason I have gone up two pant sizes. I am not even kidding. The very first time I made the recipe I fell in love. Now, I am asked to make it for every single family event. I have made them as a strawberry, blueberry, and pumpkin version. But salted caramel is by far my favorite. I start with the base of a buttery graham cracker crust. 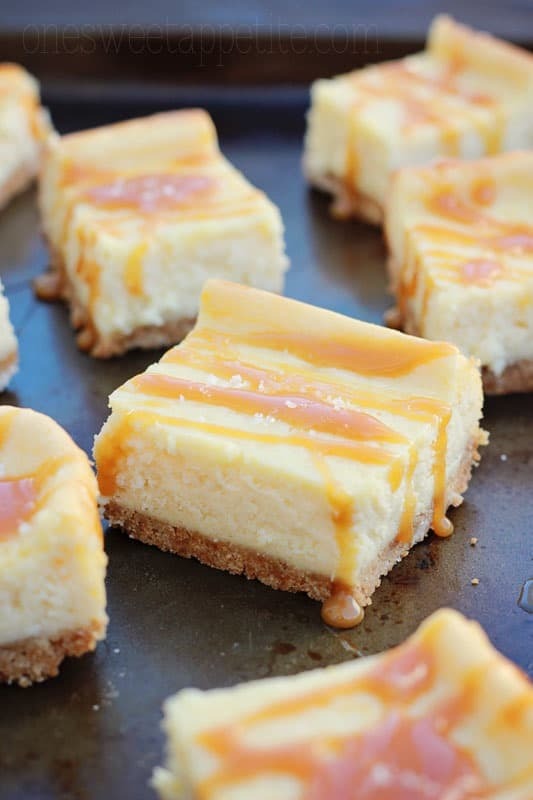 Top that with a creamy decadent cheesecake filling, and top with a homemade caramel. The big finish? Sprinkle with fleur de sel for an elegant flavor. Do not skip that last step! The salt is what boosts the flavors of this entire dessert. 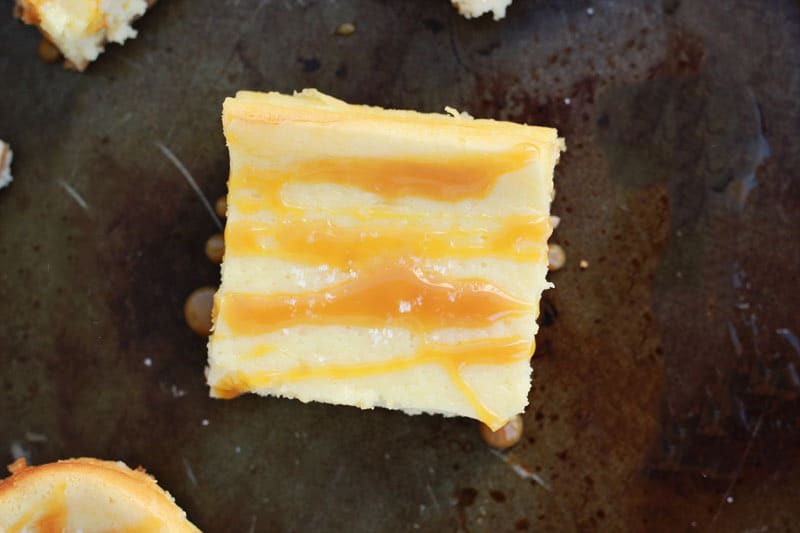 It helps blend things together and gives you the very best cheesecake bars. Fleur De Sel is a finishing salt with a light and moist texture. Its delicate flavor is perfect for desserts! It gives the boost you need while avoiding overpowering the dish. What kind of cookies should I use in my cheesecake crust? What are the best cheesecake toppings? Use room temperature ingredients. I can’t stress this enough. 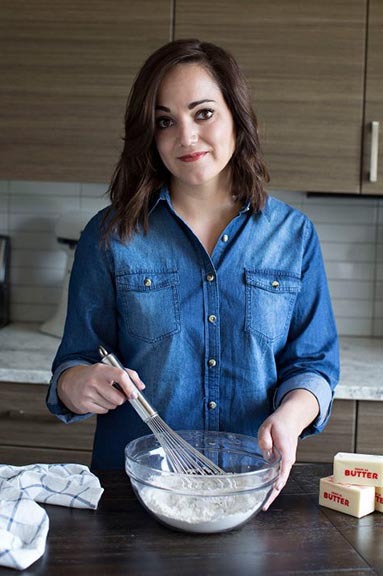 Room temperature ingredients will blend together smoothly and help keep your batter from being overly lumpy. Avoid over mixing. Over mixing the batter can cause you cheesecake to crack. Mixing with the paddle attachment on medium low speed will give you a creamy batter ready to be baked. Chill completely before cutting. 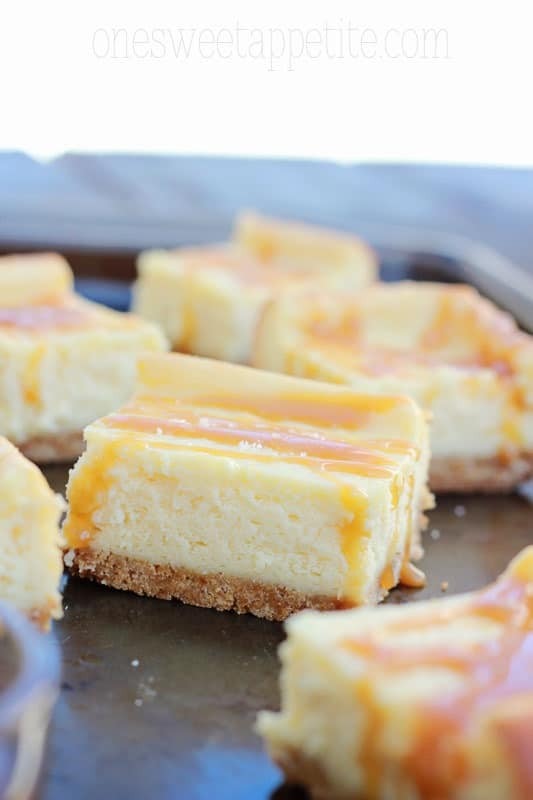 Once your cheesecake has cooled to room temperature, refrigerate. You want the bars to be completely cooled before slicing. Bake 20 minutes or until the center looks like it has set. Cool until room temperature and refrigerate for at least 2 hours if not overnight. Combine the brown sugar, half-and-half, and butter in a sauce pan. Cook on medium low heat, whisking the entire time, for 6 minutes or until it slightly thickens. Stir in the vanilla and salt. Turn off the heat and let it cool slightly. Drizzle over your cooled bars and serve. These are so flipping awesome. I’d eat them all – and I love jarred caramel. I can’t even buy it or I’ll eat it with a spoon! There are no blueberries listed in the ingredient’s list. Is the cream cheese at room temperature? Sometimes I end up with a few cream cheese chunks if it’s too cold. Try whipping just the cream cheese with the sugar until it’s smooth . Add the eggs after that until fully incorporated followed by the milk and vanilla. Hi, I know this is an older post but I just made these last night and they were so good! I was trying to make a Twix type dessert for a Halloween party and I used the basic recipe above plus I added some salted caramel to the cheesecake mix. Covered the entire thing with chocolate ganache and chopped Twix bars and it was divine! I saw your blueberry version and I think I’ll try that as well…I have some whole cherries that I pitted and froze while they were in season, so that would be a nice treat. Thank you! I am SO glad you liked them! These bars are a staple dessert here and we are always coming up with new ways to serve them. I just read how you changed things to my husband and he’s decided we need to make them that way ASAP.